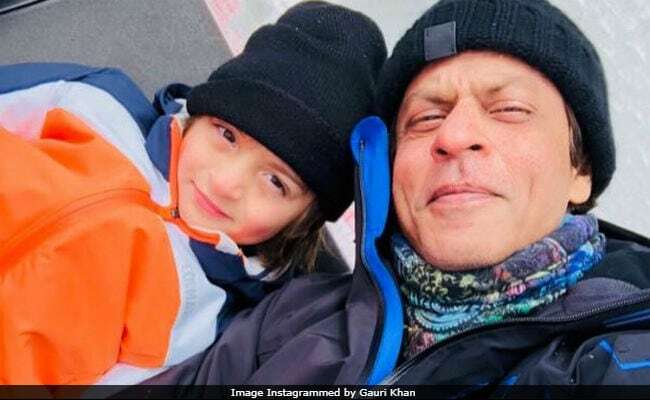 Gauri Khan shared a delightful picture of son Abram with husband Shah Rukh Khan on her Instagram and wrote, "Snowmen...," along with a heart emoticon. The picture appears to be a selfie clicked by Shah Rukh Khan, who is holidaying in Europe. The 52-year-old actor also shared a compilation of photos and videos on his Instagram that scream aloud the amount of fun that this trip involves. Shah Rukh Khan captioned his post, "In bed, in lift and in the Alps. You do get more than you can ski...with my little one on a little holiday." In the video, which comes at the end of photos slideshow, little Abram can be seen showing off his skiing skills. The 4-year-old brilliantly balances himself on those skis and totally deserves our bow. Too cool, Abram! Here's what Gauri Khan posted on Instagram. Wait for Abram's skiing act in the end. Gauri is quite active on social media and often shares pictures of her kids, Aryan, 20, Suhana, 17, and Abram. Not so much for Suhana and Abram but sharing Aryan's pictures often scare mom Gauri, who usually posts them without his permission. For which she thinks she might 'get fired' one day. Like this one time, when she posted this picture of him on her Instagram and wrote, "Posting an image ...of my son without his permission... hope I don't get fired." Take a look at some of Gauri Khan's Instagram posts of her children. Posting an image ...of my son without his permission... hope I don't get fired . Gauri Khan is an Interior Designer and co-owner of Red Chillies Entertainment. She recently launched a boutique store named Gauri Khan Designs in Mumbai. Shah Rukh Khan and Gauri got married on October 25, 1991. Their youngest son Abram was born on May 27, 2013, via surrogacy. Before heading for his 'little holiday' in Europe, Shah Rukh Khan had been shooting for Aanand L Rai's upcoming project Zero, also starring Katrina Kaif and Anushka Sharma. The trio were last seen together in 2017 released Jab Tak Hai Jaan. In Zero, Shah Rukh Khan will play the role of a dwarf. The film will hit the screens in December 2018.